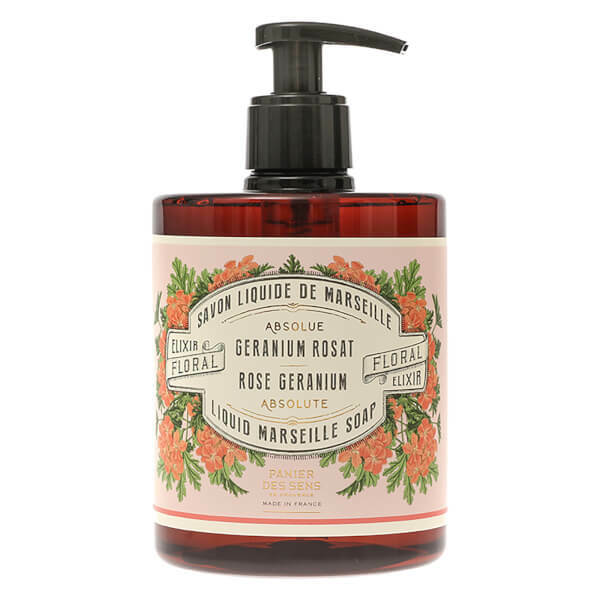 Envelop your skin in pure luxury with The Absolutes Rose Geranium Liquid Marseille Soap from Panier des Sens. Crafted from vegetable oils in a cauldron according to authentic traditions, the aromatic hand wash gently cleanses the skin, whilst helping to preserve its natural balance for hands that feel smooth and comfortable after use. Formulated with 95% natural origin ingredients, you can expect soft, supple skin with the brand's signature floral fragrance. Housed in a beautifully decorated pump bottle for convenient application. Apply a small amount to hands, massage, then rinse. Aqua (Water), Potassium Cocoate, Parfum (Fragrance), Glycerin, Potassium Olivate, Olea Europaea (Olive) Fruit Oil, Pelargonium Graveolens Extract, Hydroxyethylcellulose. Peg-40 Hydrogenated Castor Oil, Tetrasodium Glutamate Diacetate, Cocos Nucifera (Coconut) Oil.Potassium Benzoate, Potassium Sorbate, Geraniol, Citronellol, Benzyl Salicylate, Linalool, Tocopherol, Limonene, Alpha-Isomethyl Ionone.